Catherine Helstone's brother, Laon, has disappeared in Arcadia, legendary land of the magical fae. Desperate for news of him, she makes the perilous journey, but once there, she finds herself alone and isolated in the sinister house of Gethsemane. At last there comes news: her beloved brother is riding to be reunited with her soon - but the Queen of the Fae and her insane court are hard on his heels. It has been as long as it takes to tell a tale, neither long nor short. If you found yourself wanting something more in the same vein as Guillermo del Toro’s Crimson Peak, wait no more. 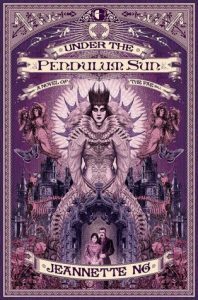 Jeannette Ng’s Under the Pendulum Sun expertly weaves fantasy, the Gothic, academia, and religion in this compelling novel about missionaries to Arcadia, the land of the Fae. The story explores a lot of the conventions and repressions of the times and of Gothic tropes (it’s got that weird castle with hidden passage ways, clever uses of light, and the madwoman down below); delves into folklore, fairy tales, and the Fae; and manages to make you think about how we view those ideas, concepts, and social constructs if you’re familiar with them. The story also manages to twist and invert all of that and make it very new, something that I think can be difficult to do well and Ng makes it look effortless. I loved the inclusion of documents at the beginning of each chapter and spread throughout to ground the story in its own reality and explore the beliefs of Catherine and Leon. The narrative moves in such a way that you, as a reader, begin to question everything, especially once Queen Mab makes her appearance and throws everything for a loop. As we are experiencing all of this through Catherine’s eyes, once the veil is lifted, all we can do is experience the horror and awe as truths come to light. Under the Pendulum Sun is dark, twisted, and well-executed, and it’s a debut. There was much failing and ahhhhh-ing from me while reading it. If you are already interested in Gothic literature, religion and its functions in society, the taboo, the Fae, you’ll want to read this. 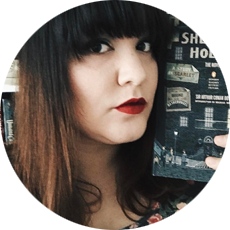 You won’t want to put it down once you’ve started, and you’ll be thinking about Arcadia long after you turn the final page. Thank you to Angry Robot and Netgalley for an advance reader’s copy! All opinions are my own.